Not only was it the first ‘people’s Bible,’ but its poetic cadences and vivid imagery have had an enduring influence on Western culture. In 1604, England’s King James I authorized a new translation of the Bible aimed at settling some thorny religious differences in his kingdom—and solidifying his own power. But in seeking to prove his own supremacy, King James ended up democratizing the Bible instead. Thanks to emerging printing technology, the new translation brought the Bible out of the church’s sole control and directly into the hands of more people than ever before, including the Protestant reformers who settled England’s North American colonies in the 17th century. Emerging at a high point in the English Renaissance, the King James Bible held its own among some of the most celebrated literary works in the English language (think William Shakespeare). Its majestic cadences would inspire generations of artists, poets, musicians and political leaders, while many of its specific phrases worked their way into the fabric of the language itself. Even now, more than four centuries after its publication, the King James Bible (a.k.a. the King James Version, or simply the Authorized Version) remains the most famous Bible translation in history—and one of the most printed books ever. King James I of England, 1621. 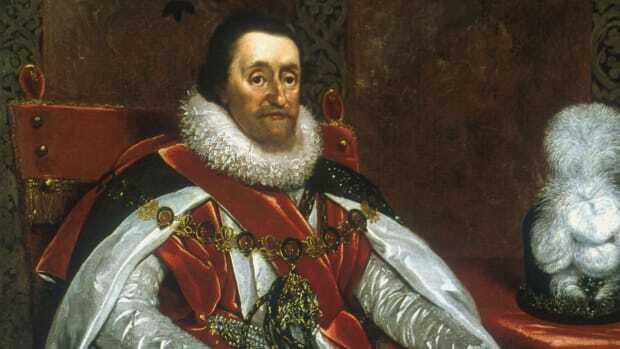 When King James VI of Scotland became King James I of England in 1603, he was well aware that he was entering a sticky situation. For one thing, his immediate predecessor on the throne, Queen Elizabeth I, had ordered the execution of his mother, Mary, Queen of Scots, who had represented a Catholic threat to Elizabeth’s Protestant reign. And even though Elizabeth had established the supremacy of the Anglican Church (founded by her father, King Henry VIII), its bishops now had to contend with rebellious Protestant groups like the Puritans and Calvinists, who questioned their absolute power.